I am not the only one nesting around here. 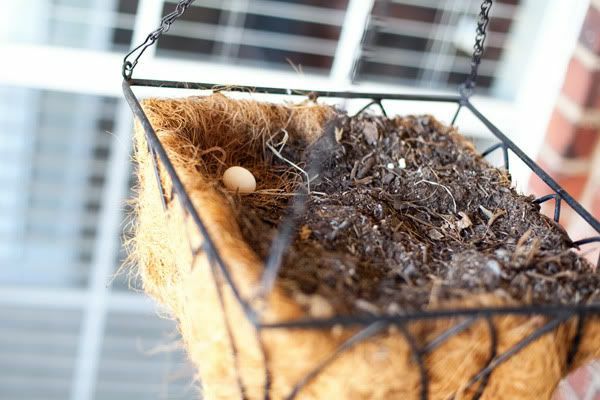 Some birds have converted one of my hanging planters on our back patio into a nest for their egg. I guess I wasn't proactive enough in getting actual plants in those planters this spring and the birds jumped at the chance for a ready-made nest. They get pretty upset when we sit on the patio and Ethan plays in the back yard, but they'll just have to live with us. We'll see if we get a chance to see the baby bird when it hatches. You've sure got alot of nesting going on over there! !